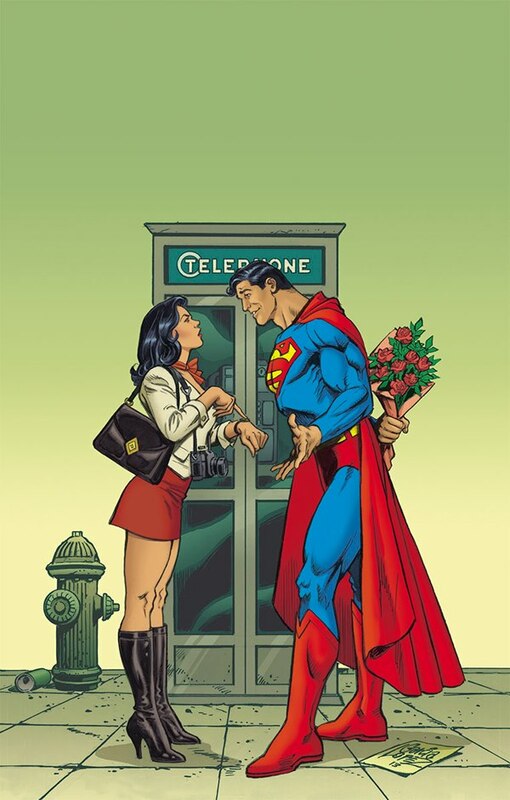 “Faster than a speeding bullet and you’re still late?” Art By Jose Garcia Lopez. One of the things I love about the holidays is some of the great history that comes along with it. I’m an absolute sucker for the History Channel’s documentaries on the stories behind Halloween, Thanksgiving and, of course, Christmas. The old photos, newspaper clippings, engravings – there’s just something so amazing to not only learn how these traditions we know today came to be (many of which are not what we think), but some of the most iconic moments to come about throughout them. That’s why I’m so in love with the story of the “Yes, Virginia” letter from 1897. In fact, I even did a reading of it when I was working in broadcasting when I was anchoring the news on Christmas Eve last year. It’s just another one of those things, like my soft spot for “Miracle on 34th Street” that fill you a wonderful feeling of why, whether you’re young or old, a good dose of belief in goodwill and representatives of it, such as Santa Claus, make life a lot less dreary. The tale has been transformed into films, specials, revealing a continuous interest in this story. There’s even been a relatively-new animated Christmas special airing on television in recent years. “DEAR EDITOR: I am 8 years old. Some of my little friends say there is no Santa Claus. 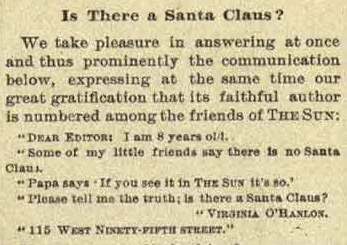 Papa says, ‘If you see it in THE SUN it’s so.’ Please tell me the truth; is there a Santa Claus?” – Virginia O’Hanlon, 115 West Ninety-Fifth Street. 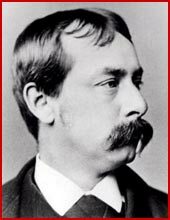 The response was printed as an unsigned editorial on September 21, 1897 and was penned by veteran newsman Francis Pharcellus Church. Since that time, it’s become a part of American folklore at the holidays, and has become history’s most reprinted newspaper editorial, appearing in part or whole in dozens of languages in books, movies, and other editorials, and on posters and stamps. “VIRGINIA, your little friends are wrong. They have been affected by the skepticism of a skeptical age. They do not believe except they see. They think that nothing can be which is not comprehensible by their little minds. All minds, Virginia, whether they be men’s or children’s, are little. In this great universe of ours man is a mere insect, an ant, in his intellect, as compared with the boundless world about him, as measured by the intelligence capable of grasping the whole of truth and knowledge. What a wonderful response. Maybe I’m partial because of my journalism past and I love the idea of a media outlet coming out with such a response to not only support, but boost her belief. It’s the way it should be. In a day and age when it seems so easy to be unhappy or unkind, isn’t it nice to show kids (and us adults), that there’s a little Santa in all of us? 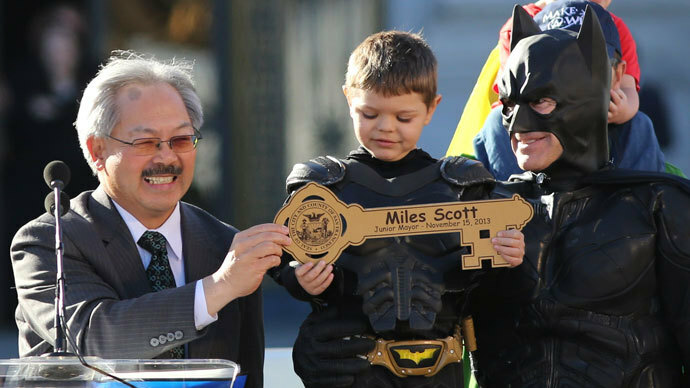 BatKid is given the keys to the city. 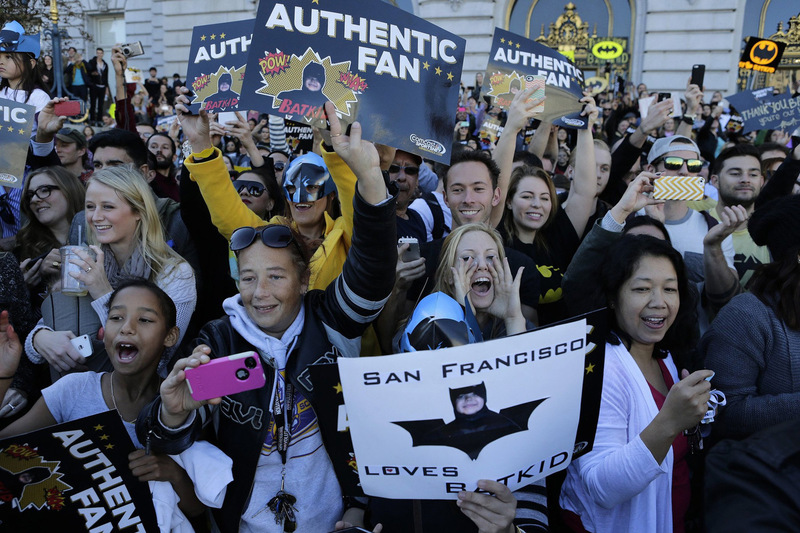 You have no doubt seen somewhere, be it television, newspapers, or the internet, the story of BatKid saving San Francisco-turned Gotham City from the likes of The Riddler and The Penguin this week. If you haven’t yet heard about it, take a second and Google “BatKid” and read a few stories about it and come back. No worries. I’ll wait. I’ll even have a cup of tea while you do so. Okay, you’re back. Pretty wild stuff, right? There’s not much I can add to this. Writers, journalists, photographers have covered pretty much every angle of the day. All I want to say is that I can not, for the life of me, think of a comparable time when I’ve seen that many people gather together on a mission of goodwill and making a child feel like a hero. Not only that, but my Facebook newsfeed blew up that day with people sharing links to stories, photos, and just generally being excited that this kid’s wish to be Batman came true. It came true courtesy of the Make-a-Wish Foundation and many, many volunteers and supporters. That last word is key though – supporters. You can throw all the money in the world at something and it may not resonate with anyone. What is it about this young boy, this dream come true to be a hero, that led so many people to take part, stand in the streets in support, or just generally get excited and invested in his heroics that day? 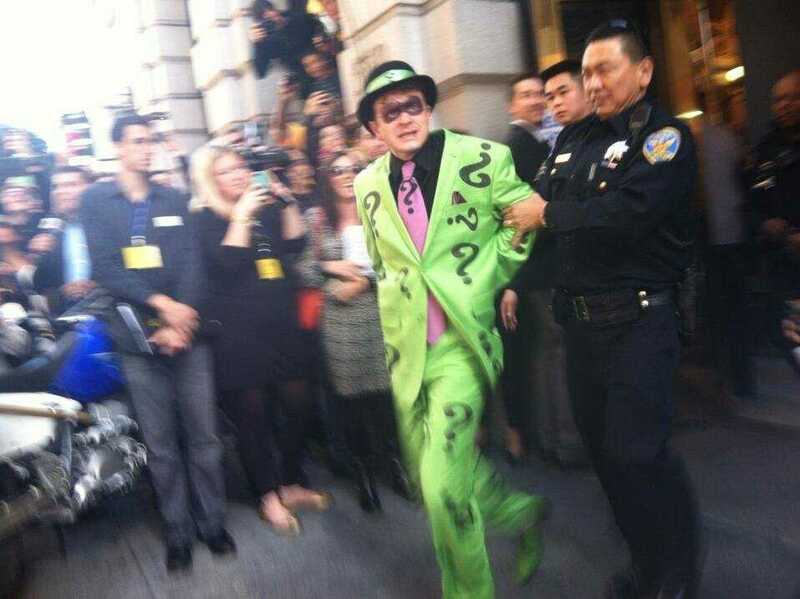 A bank heist by The Riddler foiled again. It gives me a little hope for the world. I’m often accused of being much more cynical as I age than I was a decade ago., but something with all of this just struck a chord. Maybe, just maybe, we’re not all the judgmental, polarized, cynical, hopeless lot that so many come off as day in and day out. Could it be that deep down we all want to feel the joy that comes with seeing a five-year old save the day? That inside, we want to have that sense of triumph that was felt that afternoon when young Miles stopped The Riddler and foiled a plot by the Penguin and was then given the key to the city? I say yes. We do. But don’t let it stop there. Don’t bottle up those feelings now that the event is over and the news stories begin to die down. No, no! It’s like people who only open their hearts at Christmas. Rip them open, my friends! Find that hope once again, believe in a better world. Why? Because what’s the alternative? Five year old Miles is a hero and gained the support of a city and a nation. Isn’t it time the rest of us started living every day with our hearts open and were heroes as well? Whose success are we working toward? At one point, the Brit talked about how the perception of what success is, is vastly different in America than in some other countries. I found it fascinating. He talked about how here, in America, we say that ‘everyone has the chance to win the race,’ but then said that by the very definition and nature of a race, not everyone CAN win. There is the adage of wanting to have your cake and eat it too, an adage which our American culture seems to proliferate. ‘You can be a great parent and be a great CEO,’ ‘you can be a great author and be a great family man,’ but the radio hosts were saying that in most cases, that’s just not possible. By putting all of yourself into one thing, you automatically are not putting your all into something else, therefore, neglecting it, even if slightly. Before the program ended, the question was raised as to just who was determining what success was, asking whose goals it is that we are working toward – ours or the ones that others have created for us? Are we working toward something because we truly want to, or because someone (whether it be individually or culturally) has told us that’s what we need to do. It’s a bit like I said when I signed off of broadcasting – it’s not about how much money you make, what you do for a living, what religion you are, how many Facebook friends or fans you have. 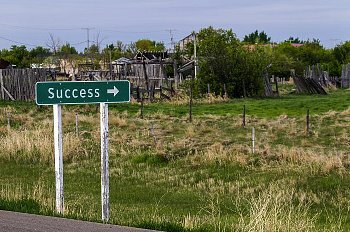 Those are determinations of success that have been created by others, yet pushed onto so many people via a ludicrous culture with misguided priorities. All this got me thinking about how my own life’s priorities have changed over the years. When I was 9 years old, I made no bones about telling everyone that I would one day be working as an animator, putting a love of drawing to work every day. Years later, in college and for some time after, I would have said nothing was going to stop me from becoming a successful screenwriter and filmmaker. However, I made a conscious decision that I didn’t want to pack up my life and take that leap away from my loved ones. Time went on. I turned my writing background to journalism. I wasn’t going to be Spielberg or Coppola, but Clark Kent? Sure, I could do that. I’d be the best damn journalist I could. In time, I got married and we had our son. Eventually, I would leave the journalism world, but it didn’t make me any less of a writer. I still write. I write this blog. I write the comic book Holidaze. I’m working on some possible small film projects. I’ve always got some other writing project going as well. Heck, I now get paid to be a writer for the institution I work for. Yes, I get to say I’m a paid writer now and that is one of the coolest things in the world to me. I’m sure the 21 year old, overconfident me would have balked, saying it was a film career or bust. The me in my late 20s would have wondered where a plethora of novels were. The 9 year old me would have wondered why I wasn’t animating ducks for Disney. However, that 9 year old me, 21 year old me, heck, even the 27 year old me, didn’t have a family, didn’t have a wife and a son, and family members he wanted them by as he grows up. The younger me didn’t realize how having this little man in my life would change my goals in life as well. Don’t get me wrong. I’m not saying don’t reach for your goals. Please, for the love of all on this earth, go for it! Have dreams! Live them! Just make sure they are YOUR dreams and YOUR goals that you’re working towards. And understand that, yes, those goals and those dreams may change. Sure, for some of you, they may be the same goals from when you were 4 to 24 to 34 to the rest of your life. They may change as you change. That doesn’t make you any less of a person, that doesn’t mean you ‘gave up,’ and that doesn’t make you a ‘loser.’ Believe me, I’ve gone through many of those feelings before coming to the realizations I have. What I’m saying is, I can still write, I can still pursue projects, but they no longer are the end goal or the success that I look for. I do them because I enjoy them. Years ago, success may have been to make a living off of being a screenwriter, a comic book writer, an author or a filmmaker. Today, success for me is about being around for that little guy when he needs me, when he wants a storyteller, a helping hand, or just someone to play around with or hug. Being a good father, being a present father, giving my all to that, and to him – that’s what a successful life for me will be. For the record, this is from long before I got into news. 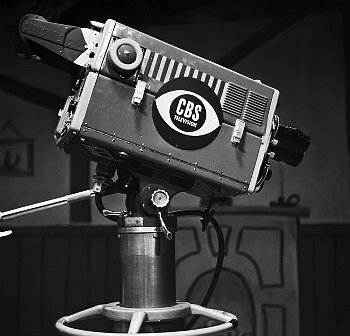 I also didn’t work for a CBS affiliate. A lot has been going on lately and life has been a bit in flux. Last Friday, after more than seven years in the journalism business, most of those in broadcasting but print before that, I left the news business. As of this week, I am jumping into a brand new career in the realm of public relations. It’s a move that I am incredibly excited about after years of just ‘feeding the beast’ to get news programs on the air with whatever content was possible amid shrinking staffs and constantly-breaking, outdated machinery (our TV station is one of the few in the country that is still editing on videotape and has yet go non-linear). At first I was a bit scared of making a leap into another career. This was the longest I had been in any job and it was all I had known for awhile. What about all those familiar faces that I would no longer see day in and day out? 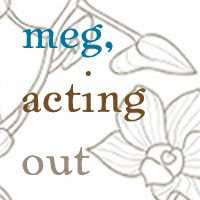 Then I realized that I was doing what we often do when we look back on something – idealizing. I wasn’t taking a look around me, but rather trying to make all that I had dealt with, put up with, and been frustrated by in my business and turn it into a footnote, while putting the good times at the front of my mind. Sometimes, we lose ourselves in what we do. For me, it became very easy. Between the long days, often taking texts or phone calls at home, or doing work online in the evenings after I left work or on the weekends, I got caught up in it. When it’s the medium of television, that goes even further, because you’re not only taking on the identity of your work for yourself, but to the public as well. So many people would stop us in the grocery store and want to talk about who they didn’t like at the station, or why they didn’t like a particular story. It didn’t matter if the person they were complaining about was a friend or colleague, or if I had anything to do with the story they didn’t like. I worked there, thus, I was their chance to vent. One of the biggest reasons I left was that I was just plain burnt-out on news. In the position I had, I was looked to for many problems for many shows. So, although I walked in at 8 to start getting things together for the noon news, by 10:30 or 11, the evening producer would be looking for what people were doing for the 5. There were many times we were still scrambling to get the Noon on the air and I was running around, frustrated, trying to figure out the 5, the 6, then soon after, the 10 and the 11, etc. It was a never ending cycle. In many jobs, when you finish something, you can take a sigh of relief. “Phew. I finished.” In news, there’s no such thing. You run yourself into the ground for one show and then you better be ready to do it all over again for another show in just a few short hours. It may have been exciting and new in my twenties, but now, with years gone by and the little guy growing like a weed, it just wasn’t for me anymore. I was coming home with chest pains, going to work each day, anxiety-ridden about what was coming and I knew that I was coming home as a person I didn’t want my son growing up with. I knew, deep down, that if I stayed on the path I was on, I would be dead before age 50, keeled over my desk. 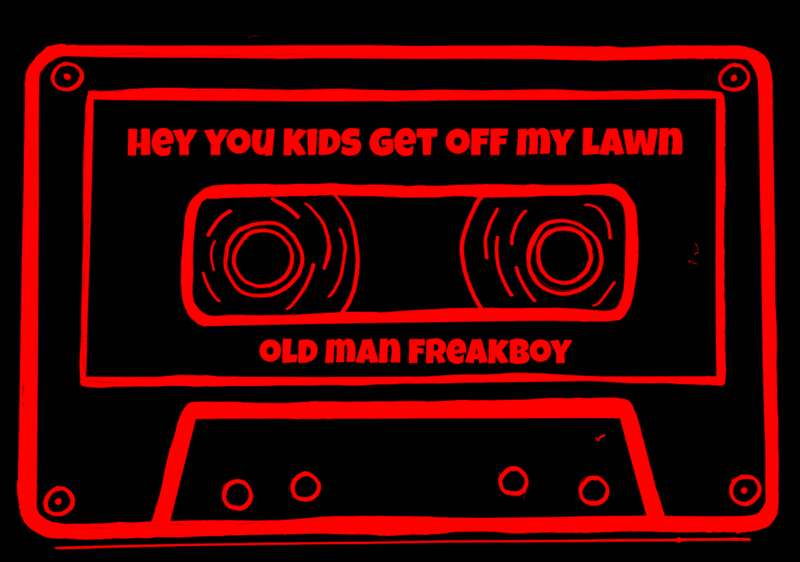 I wasn’t what I wanted my little guy seeing as an example of how to be, or how life should be. Yes, you can say ‘well, it’s a job’ but you can rationalize and glorify anything when you want to. There is an allure for many to be ‘in the TV business’ or to have people know who you are. In the end, though, what matters is how you balance that, and what you trade off for your own happiness. So I started looking outward, and when this opportunity in public affairs at a college campus presented itself, looking for someone with a background in journalism, I couldn’t leap fast enough. A new set of challenges, an exciting new start, great hours, holidays off, more time for my family. Time on the weekends and nights to spend with them or work on my passions, be it this blog, my comic series, or get back into some fiction writing. How could I say no? I know a lot of people these days measure success in different ways. I’m not one to measure it by how many people know me, how much time my face was on television, or how many Facebook friends or followers I had. For me, it’s about the quality of the life you choose to lead. Moving to a job that may not have the ‘glamour’ of my previous job may seem like a downward step to some, especially those who don’t know me. For me, though, it’s the chance to have my own life again, to carve out a future with my family and spend time with the passions that fuel me but have had to be put on the back burner for years as work became more and more consuming. It was a bittersweet goodbye. I got choked up thinking of the people who I like at work who I’ll miss seeing everyday. Then, I think of the folks who made it miserable to work there, be they certain colleagues or management. I could have left on a bitter note, given the challenges placed before me by corporate higher-ups during my transition. However, I decided I was going to leave the better person and just finish out the time, a full six weeks. I gave too much of myself over the years to have it all end badly. Besides, I was allowed the opportunity to say my proper goodbyes to the audience and my friends and colleagues, a day which I will remember fondly. I’ll miss many of the people, but I honestly won’t miss the stressful drudgery or the lack of compassion or common sense that ran rampant there. .She’s an American journalist who moved to France with her husband where they gave birth to a daughter and two twin boys and quickly learned about the vast differences in culture, parenthood, and child rearing in France versus in America. 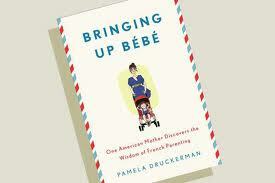 Druckerman covers a wide variety of topics in the course of her three kids’ arrivals into the world, but one of the most reoccurring observations is how calm and collected children in France are in contrast to the American parents often found chasing their kids around the park, the house, etc. They refer to it as “being sage,” a sense of calm in a child, whether they be at home or out in public. From the French culture, she learns that parents give their children rules, but it’s a limited set of rules. Those rules are important and very strict, but there is freedom within those rules. 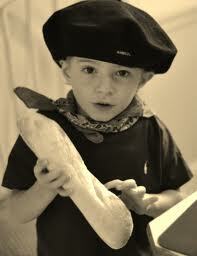 For example, one example from her French friends is children having to be in their room at a certain time each night. Now, the children may play in the room, read, etc, but that’s where they go, to the room. The method behind this is that, eventually, the children will get tired and know it’s time to climb into bed and go to sleep. The line of thinking is that this sets up boundaries for children, but is not overbearing enough where they feel they have no freedom. Rules, with freedom within the rules. Another big topic throughout Druckerman’s journey is food. American children can be notoriously picky eaters, but she finds that by starting children off with real food at an early age, and having them try new foods, adult foods, even if it’s puree early on, will develop an open-minded taste palate in children. She even recounts how many kids in restaurants in France aren’t offering off of some ‘children’s menu’ of pizza, chicken nuggets, etc, but real food off the real menu. Very very fascinating. I’m really just cherry picking two topics that stood out the most to me in the course of her book. Druckerman finds a way to take the good of the French style of parenting and blend it with her own American upbringing, but she does so why she’s living in France, a place where all children take part in a grand lunch so that their meals at dinner aren’t as large. There’s even a gouter in between. French kids don’t graze throughout the day like the American kids constantly walking around with a bowl of Cheerios. They have their breakfast, their larger meal of the day at lunch, a gouter (snack) in the afternoon, and then a smaller dinner. And just because they are better behaved and understand that they have their own lives as do their parents, the children don’t appear to be automatons from this. No, they seem to be joyous, fun-loving little people, thoroughly enjoying life. However, Druckerman does this while living amid the French culture for years, surrounded by the system that was already in place and having to adjust their American ways to it. But what about Americans living in America? Do we have to pack up and live in Paris in order to make such a switch in the way our children grow in these aspects without American ‘norms’ getting in the way? Is it possible without peers and family saying that it’s “not how you raise a kid?” because it’s not how we were raised? Now, notice I used the term “cherry picking” earlier. I did this for a reason, which is that I’m not making a blanket statement that I feel everyone should run out and do absolutely everything that the French parents do, or even what Druckerman’s family did in this book. In fact, here’s an article from Forbes completely blasting the book, saying the methods take away a child’s individuality, promote socialism and promote forms of child neglect. I can’t say I agree completely with that author, Erika Brown Ekiel, either. Like much of life, it’s not about blanket statements or ideas that are cure-alls. It’s about finding your personal balance and what works for you. For example, I love the idea about raising a child who loves the idea of exploring new foods and tastes, who aren’t raised on the kids’ menus of pizza and chicken nuggets. However, as I’ve stated in the past, I’m not a fan of the “crying it out method” when a child can’t sleep. I like the way that Druckerman describes the French authority of parents, creating a framework with a few key phrases throughout their childhood that produces those well-behaved children who are still having fun with the other kids, at the park or playroom. However, I’m not a fan of the dismissive nature of breast-feeding, as it comes across in the book, as I’m a big proponent of breast-feeding for mothers who have the ability to do so. There’s a lot of question marks up in the air and you know what? Neither one of the authors I’ve mentioned (the book, or the article disapproving of the book) has all the answers. That’s why we, as readers, as consumers of knowledge, have to take in what we can, digest it, and discover what is appealing and useful to us, and what might not serve us well in life. Maybe the best way to end this one is simply to say c’est la vie!